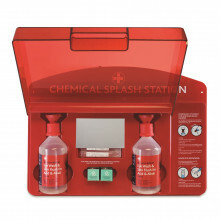 Purchase 50 or more Redcap™ Chemical Splash Stations and download your free support pack worth £100. Purchase 200 or more Redcap™ Chemical Splash Stations and you can have personalised covers absolutely free! Dual-purpose, HSE compliant eye wash station. Wipeable, hard-wearing ABS plastic with luminous printed instructions; effective for locating the station during a power cut. Dustproof heavy-duty cover keeps contents clean. Central mirror makes application easy. Contains easy-to-squeeze bottles with integrated eye bath, allowing the eye to be irrigated easily and efficiently.